The homecoming tailgate includes tons of spirited entertainment and an opportunity for alumni to gather before the men’s basketball game. Nothing keeps graduates connected to their alma mater more than a group created just for them. 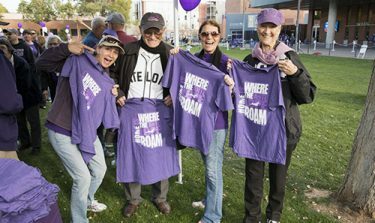 At Grand Canyon University, that group is the Phoenix Lopes Alumni Chapter, which is getting ready to celebrate the return of scores of alumni to the campus this weekend for homecoming. Generations of alumni return to GCU year after year to show their pride. 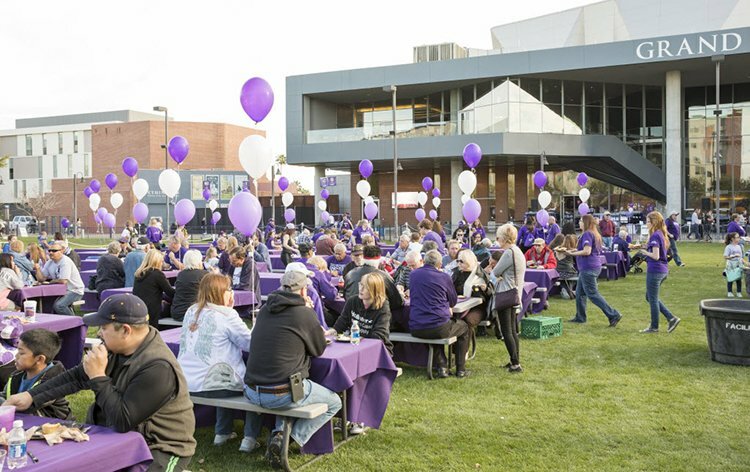 To mark the occasion, the Phoenix Lopes Alumni Chapter will host a homecoming kick-off party on Friday at the GCU Golf Course and Lope House restaurant. Activities include wine tasting and appetizers. Golfers in the group then can get an illuminating experience with a night of Glow Golf. The golf course will remain the site Saturday morning for another new gathering — brunch and canvas painting (it’s already full). Or they can fan out in the surrounding neighborhood and help on a Habitat for Humanity project. The mission of the alumni chapter is to engage and connect the University community locally, nationally and around the globe. The goal is to help alumni create sustainable, lifelong connections to the University and to each other. Vince Licciardi, president of the Phoenix Lopes Alumni Chapter, said that while “community” is a familiar phrase at GCU, it is becoming increasingly important. With more than 120,000 alumni in GCU’s network, the University community has soared in recent years, and the number is growing rapidly. The chapter aims to provide opportunities for internships, mentorship, service and community. Chapter meetings offer a chance for alumni from all majors to socialize, relax and network. The organization has hosted game-watching parties, and members have attended Major League Baseball games as a group. Others have taken the opportunity to give back by participating in community service projects through the annual Run to Fight Children’s Cancer, the kitchen at St. Vincent de Paul, Habitat for Humanity and GCU’s Back to School Clothing Drive. Licciardi said the Phoenix Lopes Alumni Chapter wants to make sure alumni are connected to and engaged in the University. It’s also an opportunity to give back with Habitat for Humanity. “By having a network, people are able to achieve more and hopefully help someone else with their own unique experiences,” he said. Nichole Jacobson, vice president of the Phoenix Lopes Alumni Chapter, spoke about the impact GCU alumni have made on her life and the potential for the alumni to impact other students now and long into the future. Last year, Jacobson attended a social event where she met an ’08 alumna and a distant relative from Bisbee, Ariz.
“For me, it was so awesome to just connect the dots, but as a leader and an advocate for GCU alumni, it’s overwhelming to see the impact,” Jacobson said. For the full homecoming schedule, click here. Contact Jeannette Cruz at jeannette.cruz@gcu.edu or (602) 639-6631.